Shamefully, none of the parties not targeted by the Taliban have unequivocally condemned this Taliban assault on democracy. But to add to the uncertainty, just a few hours ago, Imran Khan of PTI also got injured when he fell off a lifter while getting on a stage for a political rally. This is big news as he is one of the leading contenders in the upcoming elections. But what are the major concerns of Pakistanis? 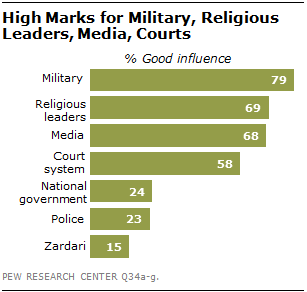 The Pew forum has a new survey out that focuses on Pakistan. Perhaps, not surprisingly, crime and terrorism is at the top at 95 and 93% respectively. But note that even Sunni-Shia tensions are labeled as a "very big problem" by over half of the respondents, and the conflict between the government with the judiciary and the military is not considered that much of a problem. 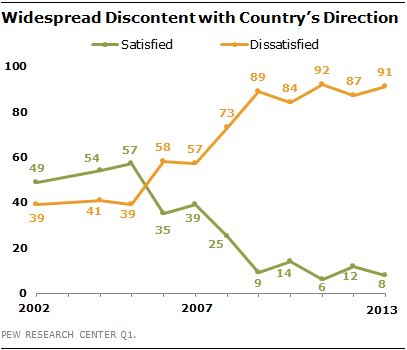 Here is a graphical representation of the opinion on the direction of the country. Note that 2007 was the start of major Taliban incursions into Pakistan (not completely unrelated to the US drone policy in the tribal regions - but that really picked up from 2009 onwards), an increase in suicide bombings in major cities and the assassination of Benazir Bhutto. 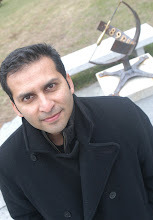 The following years also saw its impact on the economy.